The period between the Full Moon and New Moon is known as the waning moon, and this is the 2-week part of the cycle that is ideal for clearing out energetic clutter to make space for something fresh, new, and useful. You may be familiar with the Violet Flame Invocation. This is a combination of visualization and affirmation that is used together to create a powerful energetic cleansing. The most common usage of the Violet Flame is to clear the etheric body, release attachments, and brighten the aura. 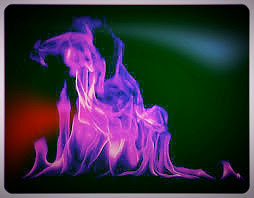 When used in this way, the purple fire of the Violet Flame is imagined to encompass the body. In this ritual, we use the visualization outside of ourselves to clear and release resentments, negative internal dialog, and intrusive thoughts. Begin by sitting in a meditative position, either in a chair or on a cushion, spine straight, neck long, and tension released from the shoulders. Light a candle in front of you, a few feet away, just a foot or two below eye level. Allow yourself to gaze gently at the candle. Let your breathing become long and deep, slowing it down as much as possible without making yourself uncomfortable. “I AM a being of Violet Fire. As your gaze softens, picture the Violet Flame expanding from the candle flame. Watch it as you would gaze into a campfire. See the flickering ends of the flames reaching upward, dancing and spiraling. Take a deep breath and close your eyes. Imagine going right into the center of your own minds eye. Expand your awareness outward into your mental body. Imagine all of your thoughts swirling around your mental space. They appear like wisps of light, colors and shapes. Some look like static electricity, these can be stress or anxiety. Some look like pieces of rope or thread, these represent ties to things from your past. Some thought forms appear like dark clouds, they can represent fear or worry. intrusive thoughts that you have picked up from someone else. they are resentments that are stuck in a loop and going nowhere. Some thought forms might even have a face attached to them. If the expression on the face is angry, they are not worth holding within. but not hard enough to blow out the candle. and be caught up in the Violet fire. See them crackle and spark, and disintegrate. Use your breath to direct the thought forms into the fire. See them shine orange withing the violet fire and disappear. Continue to take deep breaths, and exhale the thought forms into the fire. Once you feel that you have gotten them all out, take another deep breath in through your crown chakra, straight to your heart and exhale there. Allow yourself to sit peacefully once more and return to a gentle gaze at the fire. Meditate and consider the feeling of your free and open mind. Affirm your ritual closed and the working complete.